The Alfama is the oldest quarter in Lisbon. It’s winding, hilly streets and classical architecture give it an old world feel, and I had a lot of fun just wandering around, taking in the atmosphere and searching for the azulejos (painted tiles) that Portugal is known for. At night, the Alfama is home to traditional Portuguese restaurants where visitors can take in shows with fado music. I stopped in one of the dinner theaters and was treated to a delicious meal with some beautiful music and dancing. In addition to the architecture and cultural experiences of the Alfama, there are also several unique sites worth visiting. Saint George’s Castle (Castelo de São Jorge) is the main visitor attraction in the Alfama. The castle sits at the top of a steep hill which can be reached by streetcar or on foot if you don’t mind working up a sweat. The site of the castle has been home to fortifications since 48 BC, but the existing fort was primarily built in the 10th century by the Muslims, before eventually being taken over during the Christian conquest. The fort is actually very large; my pictures don’t really do it justice. There are multiple courtyards, cat walks and other sections, such as gardens and an archaeological excavation site. The best part of Saint George’s Castle is the incredible views you get of the city and the water below. There were even vendors selling wine from their carts. I didn’t indulge, but I imagine strolling the castle with a glass of wine in hand would be a great way to spend an evening. Another cool part of the castle was the peacocks I found roaming the grounds. I’m not proud of how aggressively I stalked them, but they were so beautiful I felt like I had to capture them on film (or a memory card). I also learned a lot about peacocks that day. For example, peacocks make really strange noises when they call out to each other, and they are surprisingly mobile and can fly pretty high, which caught me off guard. The peacock perched on the fence (pictured below) soared in my direction only a few moments after that picture was taken. It was terrifying. In addition to the Saint George Castle, there are several other wonderful attractions to visit in the Alfama, including the National Tile Museum, the National Fado Museum, and some truly beautiful churches. The Lisbon Cathedral is the most popular among the churches, and it’s easy to see why with its combination of Romanesque, Gothic, and baroque architectural designs. As I stated earlier, most of the fun in the Alfama (and any European city really) can be found simply by walking the streets and getting lost in another time period. Don’t forget to catch a ride on one of the street cars since some of the hills can be absolutely brutal! Commerce Square (Praça do Comércio) and Rossio Square (Praça de D. Pedro IV) are the two main squares in the center of Lisbon (within the Chiado and Baixa districts), and they are a ton of fun. These are gathering places for people to shop, dine or just relax at a café or on a bench. I especially loved having coffee in the morning in Commerce Square before it became too overrun with people. These areas are a little touristy by nature, but I didn’t feel like they were overly commercialized, and the atmosphere was so pleasant it didn’t really concern me. The best part is there are many other squares scattered throughout the city, and it was fun stumbling upon them as I explored. The Belém District, in the far-western part of Lisbon, is home to two of the most popular attractions in the city — the Belém Tower and Jerónimos Monastery, both UNESCO World Heritage Sites. The Belém Tower was built on the Tagus River in the 16th century as a gateway and defense for the city of Lisbon. The tower’s architecture is a prime example of the Portuguese Manueline style, and the tower really feels like a traditional castle both inside and out. When you arrive, you must first walk across a working draw bridge to enter the tower. Inside, there are numerous cannons that beckon you to play soldier for a moment. In the basement of the tower is an extremely small prison that was used to house prisoners until the 1830s. The tiny winding stairway leading to the top of the tower actually requires a timed entry up and down since two people are not physically able to pass at the same time. The views from each of the four levels are beautiful, and although it can get a little crowded, a visit to Belém Tower is well worth the effort. Jerónimos Monastery (Mosteiro dos Jerónimos) is a Catholic monastery in Lisbon’s Belém District. Construction of the monastery began in the early 1500s and took one hundred years to complete. Like the Belém Tower, the monastery is a prime example of the Portugese Manueline architectural style, and the sprawling building was gorgeous. The two-storied inner cloister was especially impressive. Inside the monastery’s chapel, you will find the grave of Vasco da Gama, the Portugese explorer who was the first European to reach India by sailing around the tip of Africa. Thank you! 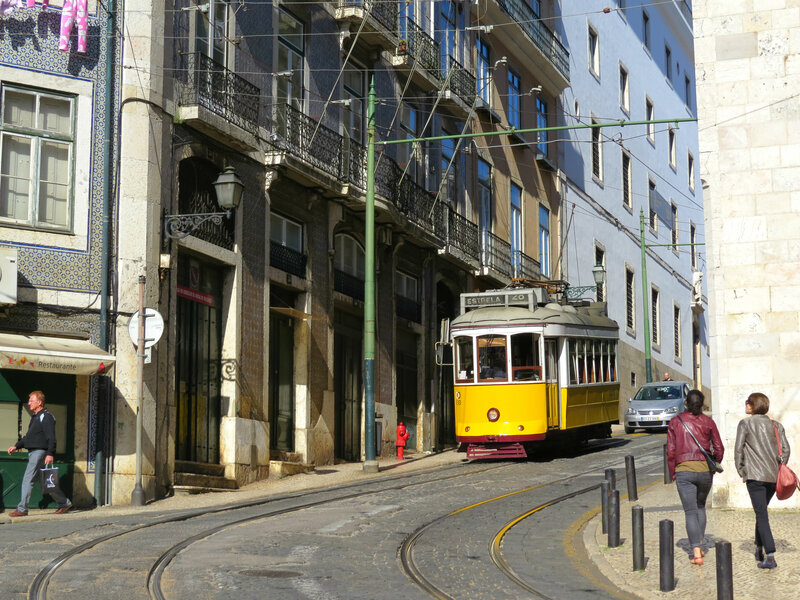 Lisbon is a great city.